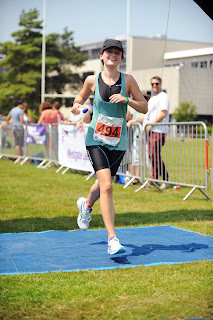 LSI Portsmouth Blog: Elly Tries to Beat an 80 year Old Man! Elly Tries to Beat an 80 year Old Man! One of the things we are very proud of here at LSI is the caring and generous nature of so many of the teachers and staff. Many of the teachers doing weird and wonderful things to raise money for charity, donating their time and effort (and cash) for wonderful causes. With one of her biggest supporters - John (Hicks) behind the barrier. 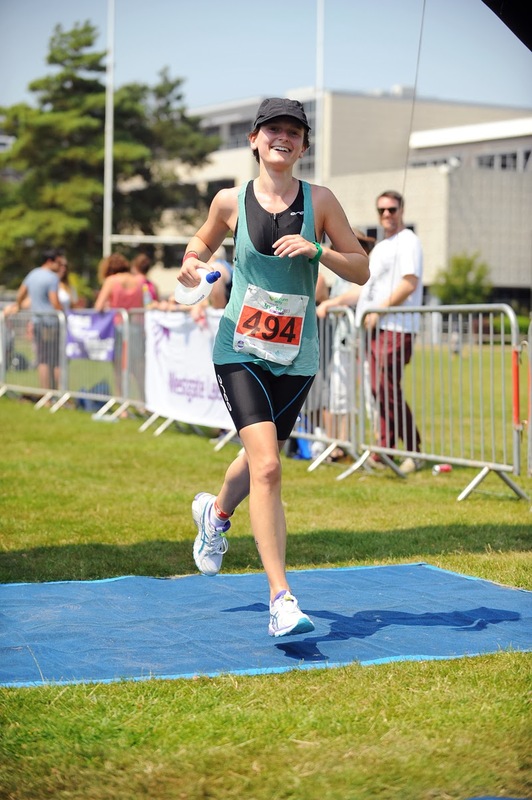 Recently Elly Easey (our lovely Reception Manager) really pulled out all the stops by completing a triathlon. For various reason we are only able to publish now, but we can't let it go without posting up about her amazing achievement. It was in aid of the Leukaemia Cancer Society and Alzheimer's Society. These were charities that were particularly important to her, as her Uncle Jim, who had both of these illnesses, sadly passed away in January. So in July in the heat of the Summer in Chichester, Elly got ready to face one of the biggest challenges of her life. Although she had started training in preparation, injury had stopped her training as much as she wished. Before the event we asked her to tell us in her own words what she would be doing and why she was doing it and below are her words. "It’s the hottest July in 7 years and the heatwave is set to continue into next week. Most people are getting their barbecues, sunglasses and deck chairs ready for the weekend but not me. No, I'm preparing my swimming hat, racing bike and running shoes because this Sunday I'm doing a triathlon. This isn't something I’d normally do on a blisteringly hot day, by the way! I’m doing this to raise money for two charities that are very important to my family - the Leukaemia Cancer Society and the Alzheimer’s Society. We hear a lot about Alzheimer’s and leukaemia in the news but do you know what they really are? Alzheimer’s is one of the causes of dementia (an illness which causes memory loss, confusion and mood swings). There are around 800,000 people with Alzheimer’s in the UK today. Sadly, there is no cure for this illness. It usually gets worse over time and it can be very difficult for both the person and their family. The money I am raising will go towards teaching doctors and nurses the best ways to help care for those suffering from the illness and also the best way to give support to the families of the patients. Leukaemia is a cancer that affects white blood cells and bone marrow. It makes the person feel very sick and weak. There is treatment for this illness and people can recover but it is not easy. In 2010 8,257 people were diagnosed with leukaemia in the UK. Amazingly, 44.5 % of patients survive their cancer for 5 years or more. With the money I’m raising, charities like Leukaemia Cancer Society hope to make that percentage a lot higher. Or if you want to help me get to the finish line, stand there with an ice cream and I’ll definitely run faster!" "I did it! I arrived early in the morning to collect my race number and set my kit up in the transition area. It made me feel a little bit better that the man registering in front of me looked about 80 years old – surely I can do it faster than him! I was definitely more than a little bit nervous before I got into the pool. There were so many people taking part and so many people watching! I think the swim was the worst part. Once I’d finished that and run to the transition area I felt much more comfortable. I could hear my family cheering me on and the atmosphere was brilliant. The cycle route went through some stunning countryside and other than my bottle falling off my bike, the HUGE hill and the heat, it was really fun. The hardest part was running afterwards. I was so hot, my legs were like jelly and I was very thirsty. After about 4 km my legs were really hurting but as soon as I saw the finish line I had a burst of energy and managed to sprint to the end. I LOVED it. 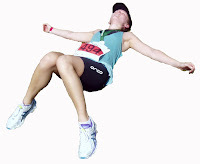 Completing that triathlon was the best feeling in the world. I was so excited afterwards I felt like I could do it all again! In total I've raised around £550. Thank you so much to everyone who made a donation. Anyone who wants to join me next year, I’ll be there, hoping to beat my time….and the 80 year old man who finished before me!"